Continental works of law are the subject of Erik Berner’s latest installment on the works of secular legislation in the St. Ignatius College Library. Francois Guizot, Democracy in France (New York/Philadelphia: 1849, Appleton). Theodore Olivier, Traite elementaire d’economie politique (Tournai: 1861, Casterman). Joseph A. Rogron, Code de commerce explique (Brussels: 1846). Emer de Vattel, The Law of Nations (Dublin: 1792, L. White). Moving across the Channel to the Continental books, I was confronted with the most challenging part of my research thus far. There are five books in the Continental category and Loyola no longer holds four of them: a mysterious entry called simply “Code civil de la republique francais” with no other information provided, an English language version of Francois Guizot’s 1849 treatise Democracy in France, an 1861 edition of Theodore Olivier’s Traite elementaire d’economie politique, and an 1846 edition of Joseph Adrien Rogron’s Code de commerce explique. 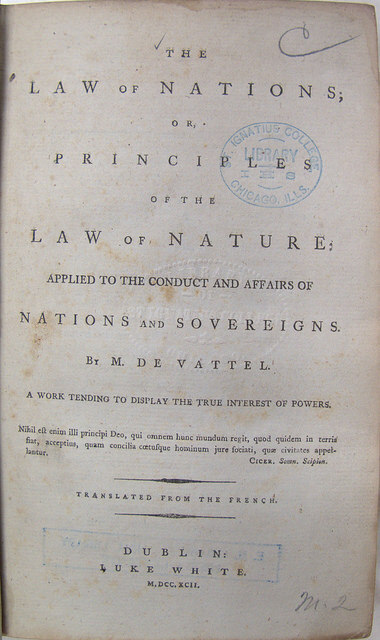 The only work still extant in Loyola’s collection is a 1792 copy of Emer de Vattel’s The Law of Nations currently held in Loyola Special Collections. To start with the most mysterious, the “Code civil de la republique francais” cannot be found in the library today. All I can do is conjecture on its identity based on my research. My working assumption is that this was a copy of the French Civil Code of 1804, better known as the Napoleonic Code. This code is noteworthy for abolishing hereditary privileges in France and serving as the precedent for much of modern European law. With no information on the physical book itself, no real conjecture can be made as to how it was acquired, from whom, or for what purpose, but a copy of the Napoleonic Code is something that the most basic legal collection should have and is therefore, not at all surprising if we ignore the lingering question of why the Jesuits wished to compile a legal collection in the first place. Copy of Guizot’s Democracy in France from the Internet Archive. Though Loyola no longer has its copy, a digital surrogate of the same edition of Francois Guizot’s Democracy in France listed in the original library catalog is available on the Internet Archive. This is a curious book, more political treatise than law (though these sorts of political works seem to be grouped in with the legislation section in the original catalog, as indicated by the presence of de Toqueville’s Democracy in America). With no prior knowledge of the book or author, I went into my research expecting to find something similar to de Tocqueville’s work, but touting the benefits of the newly established Second Republic. (The Republic was declared in 1848 while the book was published the following year.) To use a colloquialism…boy was I wrong! The author, Francois Guizot was, in fact, the Prime Minister under King Louis Philippe, the very king deposed by the creation of the Second Republic! During the reign of Louis Philippe, known as the “July Monarchy”, Guizot had been perhaps the strongest advocate of a conservative version of English-style Constitutional monarchy that severely limited suffrage. He made his reasons quite explicit in the preface to this book. Guizot claimed that “The more [he] reflect[s] upon [the situation of France], the more [he] is convinced that the evil which lies at the root of all [France’s] evils, which undermines and destroys her government and her liberties…is the idolatry of democracy.” He then proceeds to launch into a diatribe that can basically be summed up as “the masses are asses” on why he believes a more elite leadership is necessary to better guide a country, rather than leaving things up to the people. This is in direct contrast with de Tocqueville, in fact, and makes for quite interesting reading, though I am still struggling with why the Jesuits would wish to include it in the law collection. The copy in the Internet Archive was published the same year the work was written, making it possibly a first edition in English, though I cannot find any indication of whether this was the original language do the piece or if it is a translation from the French. It was printed by an American mid-priced mass publisher, Appleton, which was most famous for producing science and medical texts, including the first US printings of Charles Darwin’s works. In a similar situation to that of Democracy in France, I was able to overcome Loyola’s lack of an extant copy of Theodore Olivier’s Traite elementaire de l’economie politique by researching an online copy of the same edition available on Hathitrust.org. Perusing this 1861 edition published in Tournai by Casterman put my high school French skills to the test, and I certainly came up short many times. The preface indicates that it was written for a family audience. Spouting about the need to teach women and children the ways that capitalist society works at home, because they will not learn it dans l’ecole gives this basic text on the workings of capitalist economics its framework. (I can only imagine a sly wink when Olivier says it is intended for poor, stupid families…men were probably learning a lot they didn’t know reading it too, and one can imagine this book being used in a self-help fashion, for basic personal reference, or even in a haphazard, pre-1870 legal education.) The book’s three parts outline in a basic and mostly legible manner (even with my four-year education in the French language) how Olivier believes capitalism is the most rational way to conduct economics, based on science. Whether his arguments hold up or not I cannot say, but it could certainly prove useful for quick reference to a Jesuit enthralled in some study of economics and I can see why it would have a place at the library. Sadly, I was unable to find either the original copy at Loyola or a digital surrogate of the 1846 Brussels edition of Joseph Adrien Rogron’s Code de Commerce Explique. So I worked with a digital copy of an edition printed ten years earlier in Paris. It can almost be seen in the same light as a subcategory of English and American books that I have termed “Self-Help” law books for the property owner or civil citizen to gain an understanding of the law, for business or personal reasons. The preface claims that the work explains the Commerce Code of France, both its spirit and letter, in an understandable way. Again, it is less clear why the Jesuits would have held a book intended to help a citizen successfully make his way through the business world of France. Surviving 1792 copy of Vattel’s The Law of Nations in Loyola’s collection. Emer de Vattel’s Droit de Gens, or Law of Nations is apparently one of the most influential political treatises of the Enlightenment Era that I had never heard of. It seems to be a synthesis of the philosophies of Christian Wolff and Gottfried Liebniz, who attempted to rationalize scientifically, in the spirit of the Enlightenment, the so-called natural laws governing how nations should act, both independently and in relation to each other. Originally written in French in 1758 ,the book is addressed, in a manner similar to Niccolo Machiavelli’s Prince, as if written for an audience of rulers or would-be rulers. The political philosophy is written as if for ruling, not for practical or educational purpose of a commoner, and the preface specifically addressed “ministers.” It was translated into English first in 1760 and continued to be reprinted as it enjoyed wide popularity. This book has been massively influential on modern international diplomacy and has been cited by many contemporary leaders, especially the Founding Fathers of the United States. Ben Franklin thanked Charles Dumas for donating a copy to the Philadelphia library saying, “It came to us in good season, when the circumstances of a rising State make it necessary to frequently consult the Law of Nations” and that the book “[had] been continually in the hands of the members of our Congress.” Another anecdote about the book in relation to the Founding Fathers is the story of how George Washington’s family lost a copy he had checked out from the New York Society Library upon his death. They replaced it, but the caretakers found it at Mount Vernon 221 years later and returned it to the library in 2010. Loyola’s English-language copy of the Law of Nations is an interesting edition for a Jesuit College to own. It was published in Dublin in 1792 and is held today in Loyola Special Collections. It was likely used for personal reference by a studious priest. Interestingly, this is a reprinting of the Dublin Edition of 1787, only five years earlier, that has been singled out and noted among the various editions of this work for being particularly lean. Whereas the first English edition from 1760, and most subsequent editions, contained extensive explanatory notes from the editor, and a 1773 French edition added posthumous notes from Vattel himself, this edition contains nothing but the bare text and a short preface from Vattel. It seems likely that the Jesuits would seek this out for a legal/political philosophy collection, but to obtain a copy without the notations seems to exclude the possibility that it was specifically intended for intensive scholarship. Or it might have been the only edition they had the means, through purchase or gift, to acquire. In reflecting upon the Continental books in the secular legislation collection, I almost changed the name of the category to “French.” They all originate in French-language writing and, except in the case of Vattel’s work, deal directly with France itself. Since some of them are translated into English and were printed in a variety of locations outside of France, I felt that this was inadequate. Many of these works had a strong influence outside of France as well. I am not at all surprised that these important French works would be included included in the collections of a Jesuit College in America. French, English, and Roman law are often seen as the precedents for American law. I am rather surprised that the particular priests that founded St. Ignatius, mostly Belgian, Dutch, and German, did not have more works from outside of France, however. This might be evidence of a conscientious focus on the College as an American one and a resistance to old world nostalgia. Until the so-called “New Deal for white ethnics” of the greater New Deal attempted to include Catholics, Jews, and other non-WASP whites into “mainstream” American society, the trend was to discourage expression of Old World ethnicity and encourage incorporation into the English-speaking Protestant society. This is pertinent to Loyola’s role in its early years, a trend that seems to permeate the collecting for the library as well.